Fr. John Morcos Mikhail was born in Alexandria, Egypt in 1964. He earned a B.S in civil Engineering from the University of Alexandria 1986. Shortly thereafter he immigrated to California and worked as an Engineer for the County of San Bernardino. He served as a youth teacher and hymnology instructor at Holy Virgin Mary Church in Los Angeles from 1986-1991. He also served at St. Abanoub and St. Antony in Norco from 1992-1999. 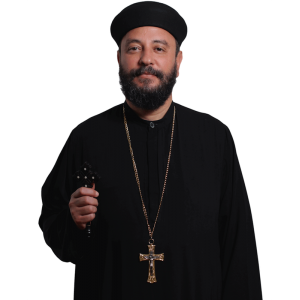 On January 24, 1999, His Grace Bishop Serapion ordained him Presbyter. He served at St. Mary Church in Victorville from 1999-2003, and is currently at St. Justina Church in Rancho Cucamonga. On Saturday, October 1, 2016, he received the priestly dignity of the rank of Hegumen.